In a pleasant surprise today, a new book dropped through my letterbox. Interpretation in a Digital Age, by Paul Palmer and Neil Rathbone, is a concise, easy to read introduction and guide for Heritage professionals starting digital projects in their places. It promises "objective and practical guidance", and lives up to that promise. It&apos;s an easy read, and neatly sums up the history of handheld guides in heritage sites as it walks the reader through concepts like: Bring Your Own Device; native, web and hybrid apps; media creation; webcams; and locational and proximity triggering. Palmer and Rathbone conclude a useful chapter on accessibility and inclusiveness with with a section on Mindfulness, wherein they argue we "need to develop more skill in the psychology of storytelling using digital media rather than blame the media". A sentiment with which, given the subject of my study, I can only agree. There are chapters on using technology outdoors, understanding wifi, compliance and intellectual property, and project management. An optimistic chapter near the end explores some of the possibilities that "the digital toolbox" might enable, and the book ends with a jargon busting glossary that reveals the intended audience museum and cultural heritage professionals who not digital experts but are thinking of commissioning something and don&apos;t want to be fast-talked by potential suppliers. It&apos;s not an academic work, it doesn&apos;t have references to other texts. Rather it is based on the practical experience to the two authors. So it&apos;s very good, if not technically detailed, on the how, and also offers practical advice on project management that will last longer than some of the technologies that are now current, but it lacks the why. It&apos;s not their intention (I think) to sell the concept of digital technology to heritage sites, rather it&apos;s a response to heritage sites looking to see what what is possible. Indeed in the introduction the authors refer to the "Gartner hype cycle", the tendency to over-estimate the potential of technology, and peter to be disappointed by its limitations. Given that more and more evidence I&apos;m seeing suggests only a maximum of five percent of heritage visitors use apps or other mobile technologies, and that I heard recently that mention of an app is currently likely to kill an HLF bid stone dead, I&apos;m still questioning whether it&apos;s possible to build a business case for the creation of digital content, let alone the purchase of hardware etc. Better late than never, its a month since I went to two events in one week, and I’ve been so busy since then that I haven’t had time to write them up. Those of you who were following my Twitter stream live may ave some idea what excited me at the time, but for anyone else who might be interested, and more importantly for my own reflection, let me ram my thoughts together into this one post on both events. We’ll start with Culture Geek in Kensington, which follows on from the M&H show, which I didn’t attend this year. This was the expensive one, with speakers flown in from other countries. I was pleasantly surprised to meet my colleague Alex there, so we were able to reflect a little between sessions, and there’s one thing especially we came away wanting to do, but more on that later. The conference touched on everything digital, including in-visit technology, but of course also plenty of on-line stuff. 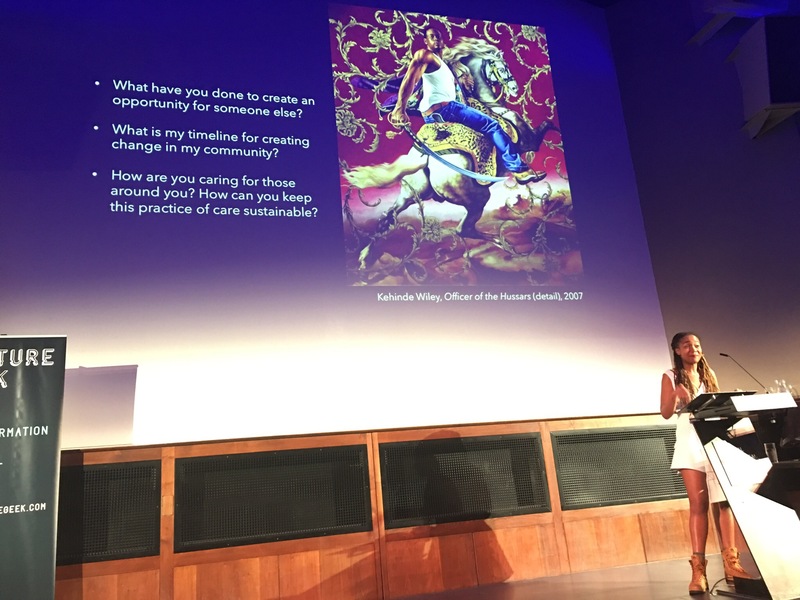 The first speaker was from that side of the field, Kimberly Drew, social media manager from New York’s Met museum. She drew on her experience as a person of colour doing a history of art degree, and how her life has changed during an internship at Harlem’s Studio Museum when a whole side of black art was revealed to her which had not been covered in her white-centric education. Keen to share her epiphany, she and a friend started a Tumblr blog on Black Contemporary Art. Now that blog has over 200,000 followers, and she has unintentionally become “a poster child for diversity.” The Met weren’t looking for a “diversity champion” when they advertised the role of Social Media Manager (I asked her afterwards), but you can see why they snapped up such a dynamic, self-motivated blogger, with experience of, and reputation for, reaching out and expanding audiences. Her work for the Met isn’t all about black art either. She sees the social media as the Met’s fourth space, alongside the 5th Avenue building, The Cloisters and the Breuer. Her role there is to share 5000 years of art; connect users with the collection; highlight the ways the museum serves art and art history, and to “humanise” the museum and create invitations to participate. This last is the objective that benefits, in theory, from her previous experience, but of course they all do. Reflecting on her talk what comes across most is authenticity. Its a challenge for cultural heritage organisations, to match that authenticity of enthusiasm for both the medium and the message, someone who lives and breathes social media and the cause. Kimberly is a young woman who inspires, and shows us how to do it, and the organisation she works for is a springboard, not a water-slides forcing her in a corporate direction. She’s one to watch. The most interesting presentation for my research was given by Joe McFadden of the Royal Opera House. they are trying a number of digital experiments as they redevelop one of their spaces, known as the Piazza, with the intention of increasing the number of daytime visitors. Currently only the tens of thousands annually, which for a central London space, is very few. Their work is in three broad areas: Transactional – things like ordering your interval drinks online, and paying with Applepay; Experiential – things like AR with hololens and VR (check out the work of the VOID) and post-show video on demand: and, Informational – things like personalised wayfinding (which made my ears prick up, but sadly when I quizzed Joe afterwards, he said they were struggling with the contending needs of different visitors at the same decision point, so It might not happen). We also talked about their current testing of an Alexa skill, so that Amazon Echo users could quiz their “household assistant” about whats on and even, possibly, buy tickets. Which tied in with a fascinating presentation I saw later in the week at the Academy of Marketing’s Digital Customer Experiences event. There Prof. Merlin Stone of St Mary’s University talked about work he is doing on Baby Boomers and the heath service. These are “the largest generation of older people the world has seen”, but also the healthiest and longest living, the richest, most educated, etc etc. though its early days in the voice first market – he sees signs that they are also likely to be enthusiastic users of Alexa and other home voice assistants, and may well expect services (he was talking about health, but it applies equally well to Opera and Heritage, where baby-boomers are currently core market) to be provided by voice-first platforms. 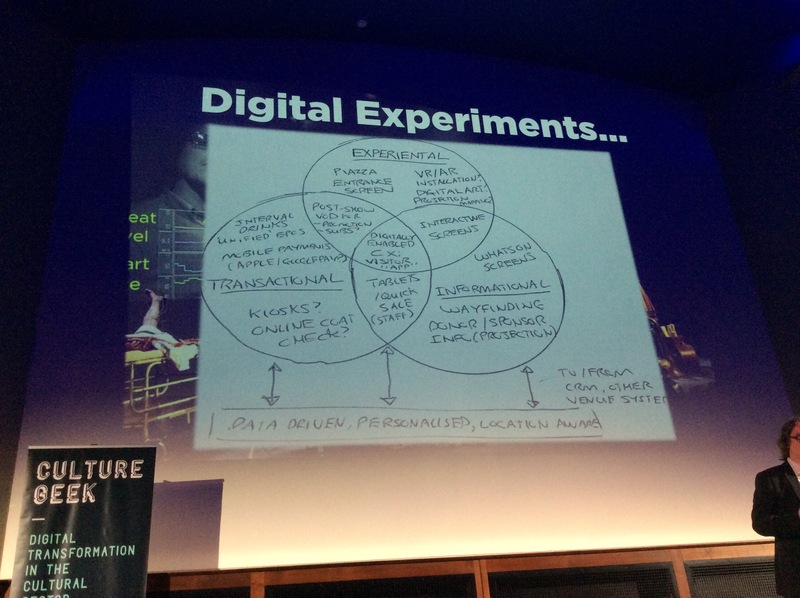 Back to CultureGeek, Tim Wood of the Ballet Rambert showed us some simple online stuff that had proven surprisingly popular – live streaming of rehearsals. Not fancy dress-rehearsals, but studio work, the repetitive practice of moves and blocking. This is what set Alex and me off on a reverie about making a “slow TV” livestream event of a voyage down the length of the river Wey. One day…. 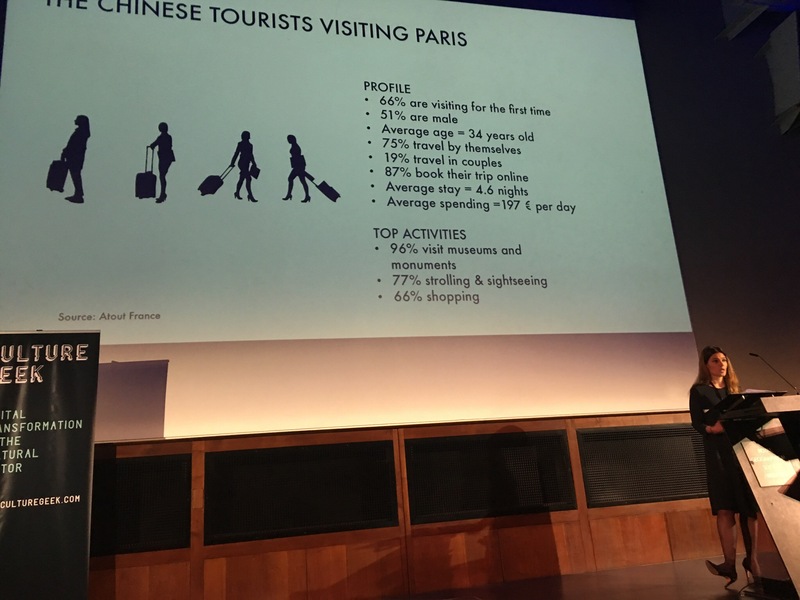 Apart from those presentations at CultureGeek, there was interest as well in Patricia Buffa’s discussion of e-Marketing the Fondation Louis Vitton to Chinese tourists. The Chinese market isn’t a big one for my market yet, they are mostly urban tourists, and ticking off the iconic sites. But if (when?) it becomes spreads into the countryside and independent travelling there’s stuff we can learn here: the importance of Weibo/WeChat; finding Chinese celebrity advocates; doing exhibitions in Chinese partner locations; and, interestingly, the ubiquity of the QR code – “in China your QR code is your business card”. We also got insight from the Science Museum’s use of Kickstarter to fund the rebuilding of Eric, Britain’s very first robot. We were shown a really interesting content management system created by MIT, and heard about building digital systems for a City of Culture in Hull. There were also some lovely experiments in mixed reality from the National Theatre, including a VR Alice in wonderland that the viewer experienced sitting on a toilet, and Draw Me Close, a VR opera that puts the audience in the naively drawn world of five year old Jordan. I’m not sure how sustainable the business model of this experience might be, the cast outnumbers the audience (of one) so that as the virtual Mum hugs you, or tucks you up in bed, a physical cast member also does it to you, to make an fully sensory experience. Its the closest we’ve come yet to the Ractors of The Diamond Age. The Digital Customer experiences event was more commercial (after all, it was hosted by the Academy of Marketing at the Direct Marketing Institute). I had been invited to give a presentation, the abstract for which I posted a few weeks back. Apart from Professor Stone, whom I spoke about above, Dr Julia Wolney introduced the day with an overview of all the points in the customer “life cycle” where AI has growing potential. … creepy. But, then, it is just also very useful. 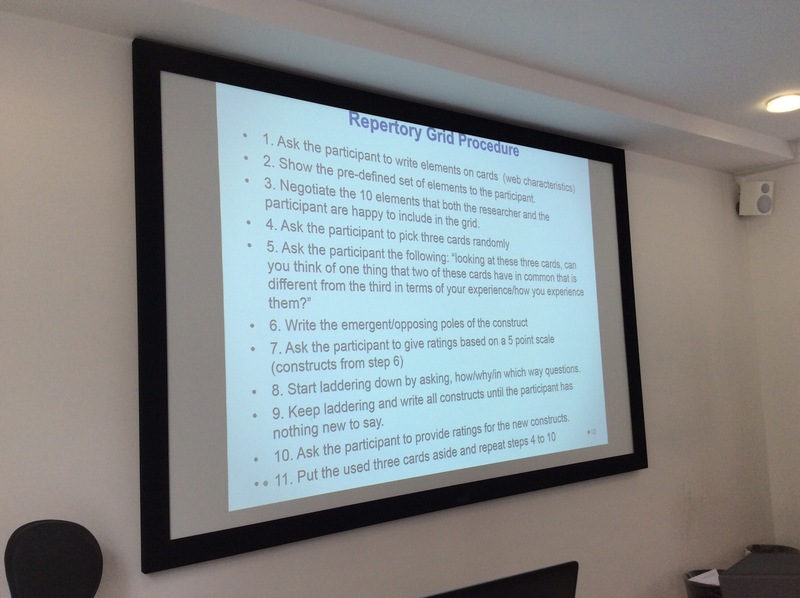 But perhaps the most intriguing presentation was from Dr Fatema Kawaf – she presented a research technique I had not heard of before, but one I think may be valuable to evaluating heritage experiences. Its called The Repertory Grid, and as the linked article shows it comes out of psychology, a technique as a method to help the individual unveil his or her constructs. As Kawaf demonstrated though, it enables participants to use their own words to construct their understanding of experiences too. Kawaf was thinking about the retail experience, but I wonder if its ever been applied to heritage? 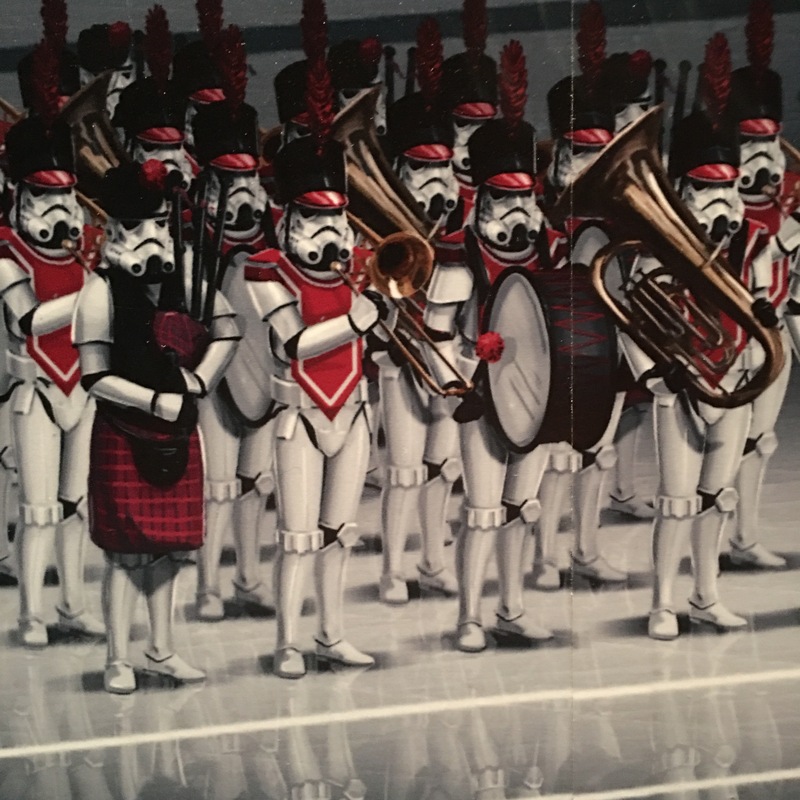 A Stormtrooper marching band? The exhibition attempts to illustrate different values with illustrations like this. The mechanics of this personalization were wristbands, or if you were latex intolerant, “credit” cards, with RFID (I’m guessing) chips, and nine (not ten as advertised) stations around the exhibit where you could make choices that defined your Star Wars identity. The content of the show were props, models, costumes, concept sketches and some original art, mostly from the first six movies (though BB8 and a couple of props were squeezed in to represent the latest phase of production), with two streams of interpretation. One stream interprets the design of characters in the movies, and the second is a sort of “science of Star Wars” strand, with basic interpretation of things like genetics. Some of all this is delivered with traditional text panels, and some is aural, delivered by an IR activated headset. You are given a “medallion” style unit to hang around your neck and hook an earpiece over one ear. Then, stand in the right place in front of a panel or AV, and the relevant sound is beamed to your unit in a choice of languages. All you need to do, is control the volume… and make sure you don’t turn away from the beam, or cross your arms over the receptor, or let anybody tall stand in front of you, cutting of the beam – all of which will cut out the sound. It’s worth pointing out that the text comes in English and French. And that may betray the exhibition’s 2012 origins at the Montreal Science Centre. That of course explains where the science interpretation strand comes from, and why objects and stories from The Force Awakens feel shoe-horned in. One can’t argue with most of the interpretation – seeing how the characters like Yoda developed over time was interesting, the science was a bit basic, and its connections with the Star Wars story questionable (the exhibition suggests Force sensitivity is a genetic trait). The stuff on personality felt just one of many different models of personality types that, despite five post-Doc academics advising on it, reads like its been cribbed from a dodgy self-help book. Interestingly, it was the personality test that was the only interactive station that wasn’t a simple choice – visitors had to answer a number of questions before it revealed their personality profile. People often tell me I’m a generally adventurous and curious person, I also tend to be energetic and social. Despite its limitations (which one is prepared to forgive more when one realizes the technology is five years old), the opportunity to create a story like this was very much enjoyed by my family. I wonder if the exhibition had a deeper emotional impact on me because of it? Another great piece from Ruth Aylett, this time from 2007. Here, she and collaborator Mei Yii Lim are getting closer to what I’m aiming for, if taking a different approach. They kick off by describing Terminal Time, a system that improvises documentaries according to the user’s ideological preference, and an intelligent guide for virtual environments which take into account the distance between locations, the already told story, and the affinity between the the story element and the guide’s profile when selecting the next story element and location combination to take users to. They note that this approach could bring mobile guides “a step nearer to the creation of an ‘intelligent guide with personality'” but that it “omits user [visitor] interests”. (I can think of many of a human tour guide that does the same). They also touch on a conversation agent that deals with the same issues they are exploring. This being a 2007 conference paper, they are of course using a PDA as their medium. Equipped with GPS and text to speech software, a server does all the heavy lifting. So, in contrast to my own approach, this guide is still story lead, rather than directly user led, but it decides where to take the user based on their interests. But they are striving for an emotional connection with the visitor. So their story elements (SE) are composed of “semantic memories [-] facts, including location-related information” and “emotional memories […] generated through simulation of past experiences”. 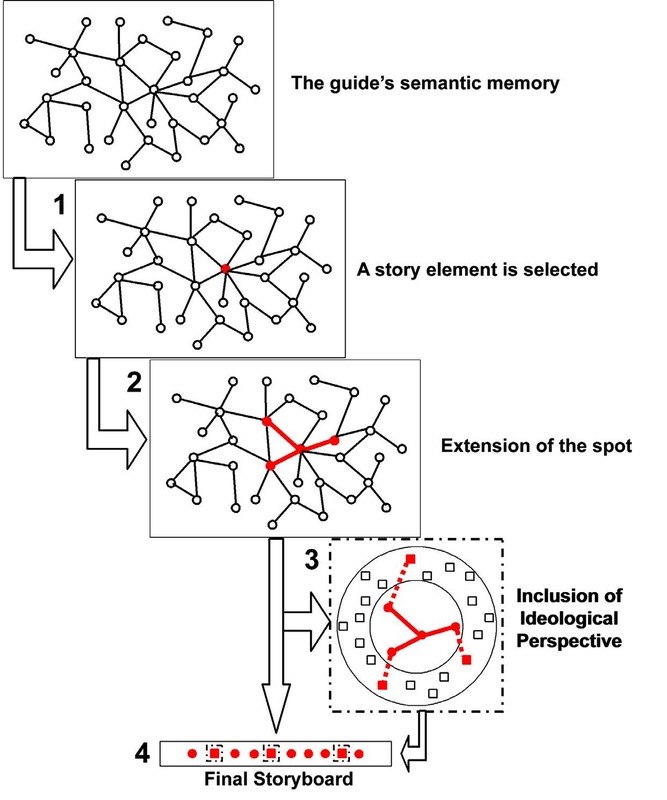 Each story element has a number of properties, sematic memories for example incude: name ( a coded identifier); type; subjects; objects; effects (this is interesting its lists the story elements that are caused by this story element, with variable weight); event; concepts (this that might need a further definition when fist mentioned); personnel (who was involved); division; attributes (relationship to interest areas in the ontology); location; and, text. Emotional story elements don’t include “effects and subjects attributes because the [emotional story element] itself is the effect of a SE and the guide itself is the subject.” These emotional memories are tagged with “arousal” and “valence” tags. The arousal tags are based on Emotional Tagging, while the valence tag “denotes how favourable or unfavourable an event was to the guide. When interacting with the user, the guide is engaged in meaningful reconstruction of its own past,” hmmmmm. So their prototype, a guide to the Los Alamos site of the Manhatten project, the guide could be either “a scientist who is interested in topics related to Science and Politics, and a member of the military who is interested in topics related to Military and Politics. Both guides also have General knowledge about the attractions.” I’m not convinced by the artifice of layering onto the interpretation two different points of view – as both such are being authored by a team who in their creation of the two points of view will, even if striving to be objective, will make editorial decisions that reveal a third, authentic PoV. I guess that’s the scientist personality talking, perhaps the military personality would instead add a different ideological interpretation of the means to an end. As I mentioned before, I’m not convinced that two (or more) faux points of view are required when the whole project and every story element that the guide gets to choose from are already authored with a true point of view. But in many other aspects this paper is really useful and will get a good deal of referencing in my thesis. I finally got to the V&A today, for their exhibition You Say You Want a Revolution. I got turned away at the end of Cromwell Road last time, as the museum was being evacuated after a bomb-scare. I’m writing this review on my way home, using my phone (so please forgive my typos) partly because I want to recommend you go, and there is not long left to see it. The exhibition charts the western cultural revolution of 1966-1970, though John Peel’s record collection, plysbof course fashion and design from the V&As own collection and other items, such as an Apollo mission space suit borrowed from other institutions. One of the gimmicks of the show is the audio, an iteration of the same technology used at the Bowie exhibition a couple of years ago. I didn’t get to go to that one, but I had a demonstration of that tech from the makers Sennheisser, at a Museums and Heritage show. I wasn’t very impressed. Though these headphones, which play music or soundtrack to match whatever object or video you are looking at, were well received by the media back then, in my experience the technology was clunky. Other friends who’d been confirmed that they changes between sound “zones” could be jarring, and that it was possible to stand in some places where music from two zones would alternate, vying for your attention. The experience this time was an improvement. It was by no means perfect: I found the music would stutter and pause annoyingly, especially if I enjoyed the track enough to find myself gently nodding my head. Occasionally the broadcast to everyone’s headphones would pause so everyone in a room could share a multimedia experience (of the Vietnam war for example) across all the gallery’s speakers, screens and projectors. These immersive over-rides were effective, in much the same way as those at IWM North, but when a track you were enjoying or a video that you found interesting was rudely interrupted, one couldn’t help but feel annoyed. I found myself forgiving the designers however, for this and even the stuttering sound of the headphones, because it all felt resonant with that late sixties “cut-up” technique. Where the technology really worked however was on two videos that topped and tailed the exhibition. In the first various icons and movers of the period were filmed in silent moving portraits of their current wrinkled and grey selves. Their reminiscences of the time appeared as typography overlaying their silent closed-mouth gaze, a little like Barbera Kruger’s work, while over the headphones you heard their voice. The same characters appeared at the end, that s time as a mosaic of more conventional talking heads. And for the first time, the interpretation was didactic as each in turned challenged the current generation to build on their legacy. For me, one of the highlights was the section on festivals, which invited visitors to take off their headphones, lie back in the (astro)turf and let (another cut-up of) the famous Woodstock documentary wash over them on five giant screens. The other things I loved were, dotted around among the exhibits, tarot cards that, at first glance, looked like they might have been designed in the sixties. But then you notice references to things like Tim Berners Lee and the World Wide Web. You realise these are a subtle form of interpretation, telling a future of the sixties that apparently came true and for those of us from that future, creating correspondences and taxonomies that connect the events of 1966-70 with today. The V&A commissioned British artist Suzanne Treister to create the cards, based on her 2013 work, Hexen 2.0. And the very best thing about them is you can buy them (pictured above) in the shop which must be the first time copies of museum interpretation panels have been made available for purchase. Of course, the aren’t the only form of interpretation. About from the soundtrack, there are more traditional text panels, labels and booklets around the exhibition. 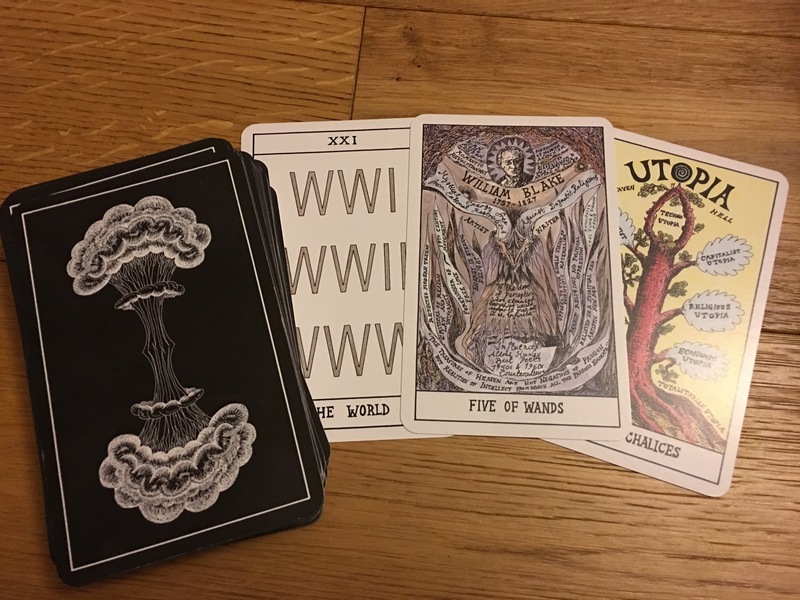 But the cards show how cleverly the layering of meaning and interpretation has been created. Many visitors will have passed them by unnoticed, given them a cursory glance or chosen to ignore them, and will have had an entirely satisfactory experience. But for those that paused to study them in more detail a whole new layer of meaning opened up. I visited with a sense of duty, to try out a responsive digital technology. But I found so much more to enjoy. This is a brilliantly curatored exhibition. So much better than the didactic, even dumbed down permanent gallery of the new Design Museum which I visited before Christmas. I urge you to go, if you haven’t seen it yet. It’s only on for another month. A colleague who had visited the exhibition before told me how depressed it had made him: the optimism of that period seems to have been dashed upon the reactionary rocks of 2016, Brexit and Trump. But I came out with a very different mood. One of the early messages of the exhibition is the period as a search for utopia. The final tracks you hear as you walk out (after the video challenge issued by the old heads of the sixties) are Lennon’s 1971 single Imagine and then, brilliantly, Jerusalem. Building on research in Brain Computer Interface (BCI) the team worked with an artist to create a filmed narrative that “ran for 16 minutes, progressing through 18 scenes. 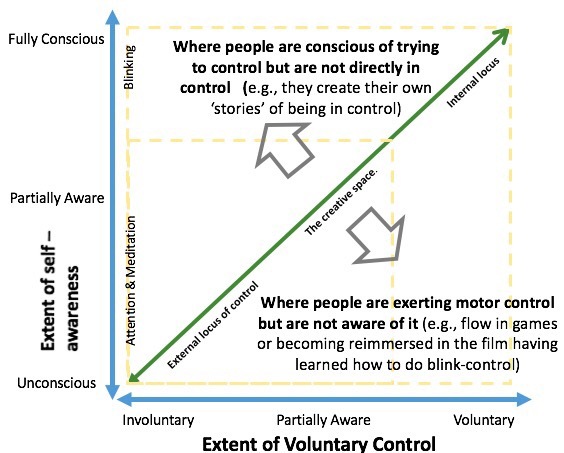 However, each scene was filmed as four distinct layers, two showing different views of the central protagonist’s external Reality and the other two showing different views of their internal dream-world.” Which layers each viewer saw was selected by the EEG device, for rather by the viewers’ blinks and states of “attention” or “meditation” as recorded by the device. 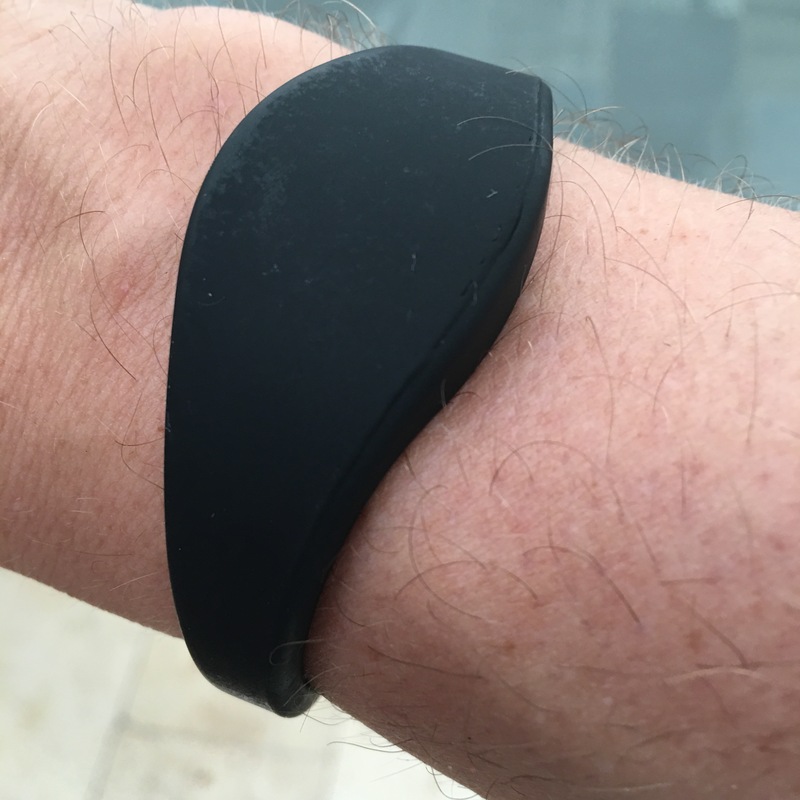 The authors admit to some skepticism from the research community about the accuracy of the device in question, but that was not what as being tested here. Rather, they were interested in the viewers’ awareness of the ability to control the narrative, and their reaction to that awareness. With which, I think I agree. The other reason the paper interests me is that they described their research as “Performance-Led Research in the Wild” and pointed me towards another paper to read.